Cameron Mitchell's "dish room to board room story" began when he was 16-years-old and started working as a dishwasher at a local Columbus, Ohio steakhouse. Two years later, when Mitchell was working as a line cook during a chaotic shift change, he had an epiphany. He realized he loved the restaurant business and set out to make it his lifelong career and knew he wanted to be the president of a restaurant company one day. That evening he put pen to paper to map out his career goals, waking his mother in the middle of the night to share them with her. Those goals - to attend the prestigious Culinary Institute of America (CIA), to become an executive chef by age 23, to be a restaurant general manager by age 24, and ultimately to be president of a company by the age of 35 - eventually were the benchmarks that would set the course of his restaurant industry career. 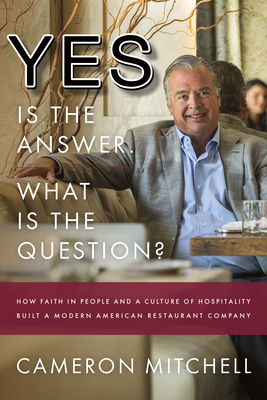 In 2008, Mitchell's prominence in the industry increased exponentially when he guided the sale of two of his most popular concepts - Mitchell's Fish Market and Mitchell's Steakhouse, a total of 22 restaurants - to Ruth's Hospitality Group for $92 million. To this day, CMR remains independent and privately held recognizing nearly $200 million in annual revenue from its 34 restaurants and catering division. This book tells the story of Mitchell's rapid rise, his rags to riches story and lessons that any entrepreneur or anyone can learn from it.